Arts & Economic Prosperity 5 (AEP5) is Americans for the Arts’ fifth economic impact study of the nation’s nonprofit arts and cultural organizations and their audiences. By every measure, the results are impressive. Nationally, the nonprofit arts industry generated $166.3 billion of economic activity in 2015—$63.8 billion in spending by arts and cultural organizations and an additional $102.5 billion in event-related expenditures by their audiences. This activity supported 4.6 million jobs and generated $27.5 billion in revenue to local, state, and federal governments (a yield well beyond their collective $5 billion in arts allocations). AEP5 is the most comprehensive study of its kind ever conducted. It provides detailed economic impact findings on 341 study regions representing all 50 states and the District of Columbia. Data was gathered from 14,439 organizations and 212,691 arts event attendees, and project economists customized input-output models for each and every study region to ensure reliable and actionable localized results. Connect2Culture participated on behalf of the City of Joplin for the first time in history. Arts & Economic Prosperity 5 provides evidence that the nonprofit arts and culture sector is a significant industry in the City of Joplin—one that generates $5.4 million in total economic activity. 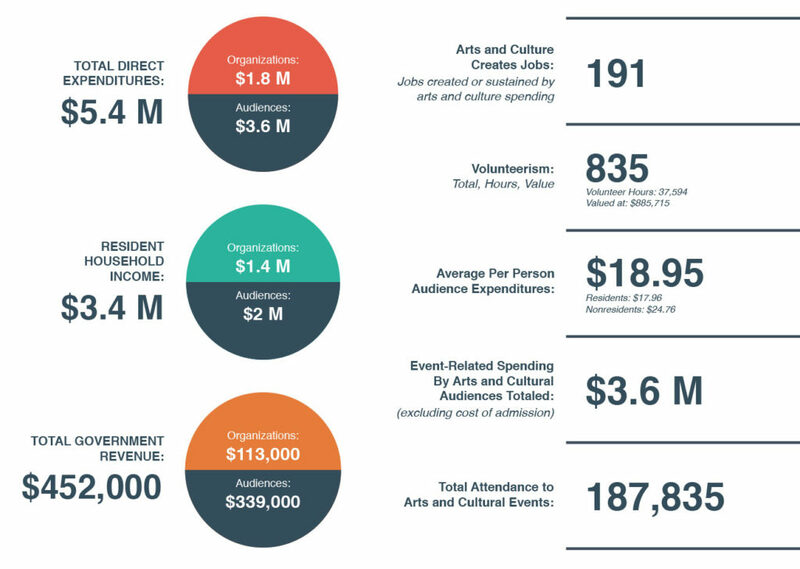 This spending—$1.8 million by nonprofit arts and cultural organizations and an additional $3.6 million in event-related spending by their audiences—supports 191 full-time equivalent jobs, generates $3.4 million in household income to local residents, and delivers $452,000 in local and state government revenue. This economic impact study sends a strong signal that when we support the arts, we not only enhance our quality of life, but we also invest in the City of Joplin’s economic well-being. Defining Economic Impact: This proprietary study methodology uses four economic measures to define economic impact – full-time equivalent jobs, resident household income, and local and state government revenues. Full-Time Equivalent (FTE) Jobs describes the total amount of labor employed. An FTE job can be one full-time employee, two half-time employees, etc. Economists measure FTE jobs, not the total number of employees, because it is a more accurate measure that accounts for part-time employment. Resident Household Income (often called Personal Income) includes salaries, wages, and entrepreneurial income paid to residents. It is the money residents earn and use to pay for food, shelter, utilities, and other living expenses. Revenue to Local and State Government includes revenue from local and state taxes (e.g., income, sales, lodging, real estate, personal property, and other local option taxes) as well as funds from license fees, utility fees, filing fees, and other similar sources. Local government revenue includes funds to governmental units such as city, county, township, and school districts, and other special districts. This study could not have been completed without the cooperation of the 20 nonprofit arts and cultural organizations in the City of Joplin, listed below, that provided detailed financial and event attendance information about their organization. Want to see the full 32 page report? Click here to download your copy! Want the two-page synopsis? Click here to download your copy!